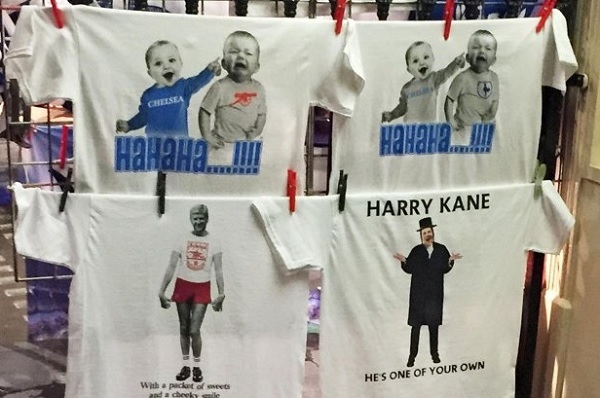 Chelsea football club are set to take legal action against unofficial vendours who are selling abusive t-shirts picturing Tottenham Hotspur striker Harry Kane as a Hasidic Jew. The Times reports the Premier League champions are now looking to halt the sales of the shirt – along with other offensive t-shirts – which are available to buy prior to home games at Stamford Bridge. The shirt in question depicts Kane dressed as a Hasidic Jew with the slogan: “He’s one of your own”, in reference to Spurs fans’ chant for the England striker who came through the Club’s academy.